This Beneteau Cyclades 43.4 is powered by a 54hp diesel engine with sail drive and dual steering positions. This sloop rigged Beneteau Cyclades 43.4 features in-mast furling and an aluminium boom, she also has a roller furling genoa. Sails included on this Beneteau Cyclades 43 include mainsail, genoa and spinnaker. 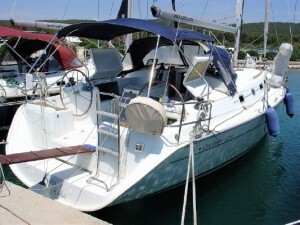 Accommodation for 8 is provided within 4 cabins on board this Beneteau Cyclades 43.4. Forward is a double cabin with spacious double v-berth, there are storage shelves and a hanging wardrobe located to starboard. To starboard, aft of the fore cabin, is a bathroom featuring a manual head, basin and shower. To port is a guest cabin with bunk beds. There are two further cabins to aft, each providing a double berth, and storage wardrobes. There is also a second bathroom with a manual head, basin and shower. The open-plan saloon and galley on this Beneteau Cyclades 43.4 features a U-shaped seating area with dining table and additional bench seat. The galley is well equipped with a gas oven/stove, refrigerator, and double sinks with pressurised water.